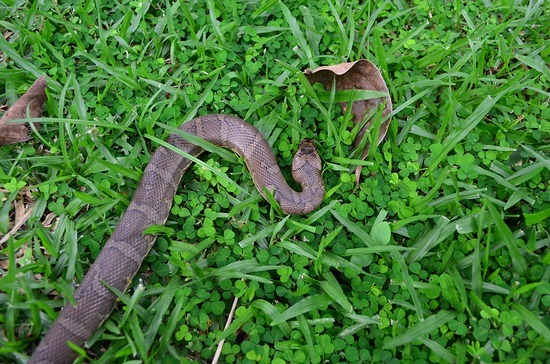 A bitey puff-faced watersnake (Homalopsis buccata). There is nothing quite like a bite from a snake, when you’re completely not expecting it. I’ve caught a number of these “Puff Faced Water Snakes” – Homalopsis buccata, and while one bit the tongs, none has ever attempted to strike at me. That changed the other night while on a herping trip with Courtney from North Carolina in the states. I grabbed it fine the first time, and it death-rolled so fiercely I thought it was going to break it’s own neck. I let it go back on the ground by the pond I’d just picked it up at. The flashlight was shining right in his face – and I was coming up on the approach from behind, but, in hindsight – a bit too much to the side, and he could still see my hand coming. He twisted and struck backward and sideways to grab my middle finger fiercely. I did the twitch, you know, where you jerk your arm in an exaggerated fashion, twirling the snake around like a circus baton, by the mouth on your finger – putting the teeth MUCH deeper than they were originally? Yeah, I did that. He was NOT letting go, so I asked Courtney to gently put the snake hook point through the jaw between my finger and the joint. Eventually the top opened enough, and then I snuck the bottom finger out. No re-bite, which I was thankful for. This was a juvenile, but these snakes have powerful jaws, and 26 teeth (I counted the puncture marks on my finger). I was bleeding good, and Courtney got a few pics. Will put one up when she sends me one. Though a snake is not “known” to bite… do not take it for granted. Practice the same techniques as always to keep from getting bitten. Twenty-six teeth in your finger is not a good feeling… more importantly, you could break some of them in your finger – harming the snake.